Walking into Apotheclaire is literally a breath of fresh air –the new eco-responsible salon in Downtown Akron makes natural, organic and chemically-reduced alternatives their priority. Unlike most salons, Apotheclaire recycles 98 percent of their waste, such as color leftovers, vinyl gloves, product packaging and hair. Apotheclaire is part of the Green Circle Salons, which has warehouses that use recycled hair to make oil booms. The oil booms are used to clean up oil spills, and can be reused several times, unlike synthetic booms. The idea of Apotheclaire began with owner Claire White, who has a long history of being hypersensitive to many chemicals and fragrances. The name Apotheclaire was inspired by the word “apothecary,” which in Latin means shopkeeper, creatively combined with Claire’s name. White told stories of the struggles she would go through when getting a haircut. The hair salons would have to make sure there were no chemical products lying around or any fragrances lingering in the air. White said there are others like her; however, her main goal is to make sure that Apotheclaire provides the best service in the nicest environment possible, regardless of if a customer has the intention of being toxin-free. “We try to keep the environment clean enough and comfortable enough that if you come in here for a service, you’re going to leave here feeling good,” White said. In addition, Apotheclaire is also a retail shop that sells a variety of natural and organic beauty, skin, hair, personal and home care products. One of White’s favorite products that she sells are wool dryer balls. These dryer balls are an eco-friendly alternative to dryer sheets and fabric softeners, which have harmful chemicals and perfumes that coat clothing. In contrast, the dryer balls have no chemicals and can be used over and over again. White said the intention she has for Apotheclaire is to have a series of shops in one place. In addition to the services and products Apotheclaire already provides, Claire hopes that if there are opportunities for the salon to grow, she will be able to put them all under the same roof. Apotheclaire is located on 70 E. Mill Street in Akron, on the ground floor of Greystone Hall. Salon hours are Tuesdays and Thursdays from 10 a.m. to 8 a.m., Wednesday and Fridays from 10 a.m. to 5 p.m., and Saturdays from 10 a.m. to 4 p.m.
For more information about Apotheclaire, visit their website at www.Apotheclaire.com and check out their Instagram account @Apotheclaire. 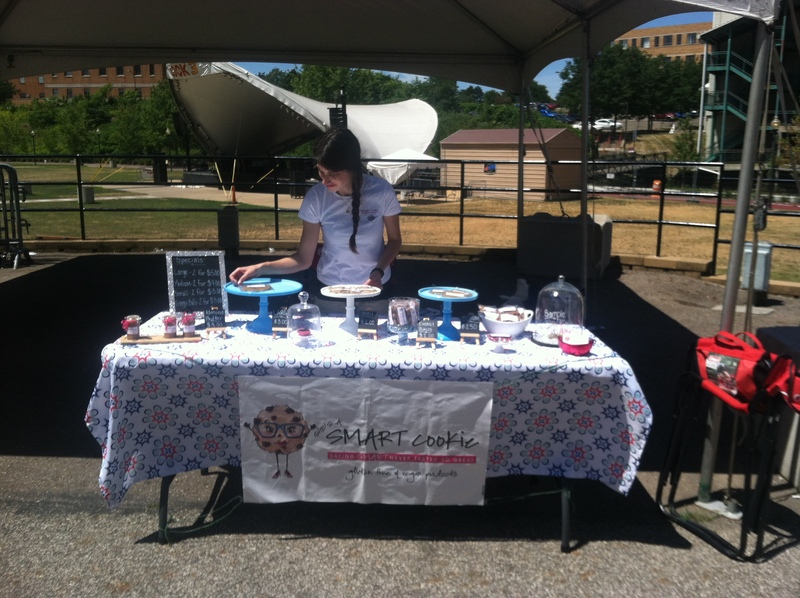 Shana Stiel, creator, owner, and sole-employee of She’s A Smart Cookie, a gluten-free and vegan treats business, brings healthy and tasty snacks to Northeast Ohio and Akron’s The Market at Lock 3. Stiel’s certified home bakery is located in North Canton. She provides services primarily at farmers markets and to businesses and bakery shops in Cleveland, Akron, Kent, and other surrounding Ohio areas. Stiel delivers special orders to cafes where her products are then featured. She’s A Smart Cookie is sold at several shops in Akron such as Highland Square’s Angel Falls Coffee and The Coffee Pot Cafe downtown. Stiel is very active in the downtown Akron dining life through her involvement at The Market at Lock 3 and her locations in Akron stores and bakeries. Stiel makes various baked goods, health snacks, and energy bars; providing a wide range of gluten-free and vegan options that taste good and provide essential nutrients. Her specialties are cookies, granola, almond butter, and energy balls. These products are not only completely vegan, but they are also packed with natural ingredients- with no fillers or artificial flavors. Her treats are both healthy and delicious. “I want to make a cookie taste like a cookie—not like it’s trying to be a cookie,” Stiel said. Stiel began her business after personally suffering from food allergies. For the past 4 years, Stiel struggled with countless health problems. She was lethargic, constantly tired, and had severe migraines and body pains. After seeing numerous doctors, none of whom could diagnose her, Stiel sought a solution through her diet. Similarly, Stiel’s sister suffered from allergies to wheat and dairy, which encouraged Stiel to get testing done for food allergies. After getting the results back from her tests, Stiel learned that she was allergic to wheat, dairy, and gluten. This knowledge motivated Stiel to change her diet drastically. She already maintained a vegetarian diet and exercised regularly, but this inspired her to look for more ways to improve her lifestyle. “No food tasted good enough for me to feel so bad,” Stiel reminisced about the first few weeks upon discovering her food allergies. Over time Stiel adapted to a gluten-free and vegan lifestyle. She felt the results of her diet change immediately; quickly recognizing the improvement in her body and health. Still, Stiel struggled while grocery shopping for foods. She found that most products in stores were loaded with gluten and artificial fillers. She always loved baking, so she took matters into her own hands and began testing ingredients to create more options that her sister (the sister with a sweet tooth) and she could enjoy. As Stiel saw the changes and improvement in her life and diet, she wanted to share this with others, knowing that she couldn’t be alone in this issue with her allergies. Stiel hoped that if the awareness of gluten-free snacks that tasted good reached the public, more people might make the switch to wheat and dairy-free products. Stiel is passionate about helping others with health problems, and she encourages those who struggle with aches and lethargy to get tested for allergies to food. Yet, Stiel also seeks out people without food allergies to still take a look at their diets and find room for improvement. Stiel said that if vegan products taste as good as regular products, people’s bodies might feel and look better eating the first choice. While grocery stores primarily offer popular manufacturers’ brands, despite their unhealthiness, Stiel’s goal is to popularize not only She’s A Smart Cookie products, but gluten-free and vegan options in general. “I think it’s getting to that point where people want to be healthy now,” said Stiel. Taking the initiative to put her product in numerous shops and bakeries, Stiel hopes people become familiarized with her vegan treats and make the transition over to a healthier diet. Stiel’s business is continually growing; roughly every week, she starts selling to at least one more bakery in Ohio. Her goals are to one day see She’s A Smart Cookie as a trusted and recognized brand in bakeries and grocery stores everywhere.